Blissful, brilliant & budget friendly. 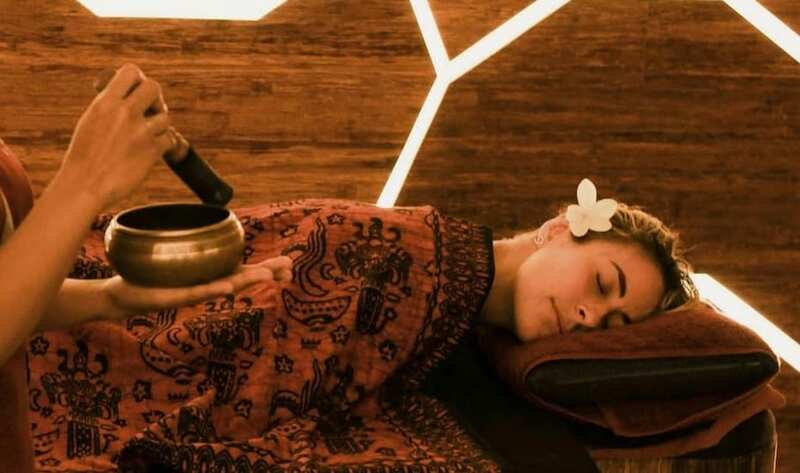 We tested out the best value-for-money spas in Bali for your next mind-melting rub down - the top spots to get more bliss for your buck. You're welcome! If you thought Bali couldn’t be any more blissful with its azure seas and hidden waterfalls, you thought wrong. We bring you a roundup of Bali’s best budget spas, where treatments are under $25, yet no expense has been spared on top-notch therapists. Take your pick from traditional Balinese massages or glam mani-pedis, to fabulous blow outs, body scrubs and silky-smooth hair treatments. We’ve even included a few little spa splurges for when the mood strikes. So go forth and surrender – you deserve it! A solid fave with the expat crowds, La Beaute is a one-stop budget spot for all of your beautifying needs. 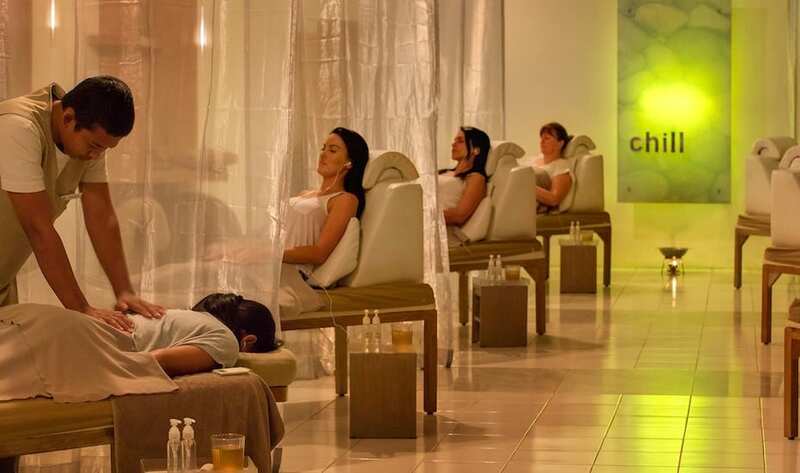 Regularly buzzing with both men and women treating themselves to massages, scrubs, waxes and manicures, you could spend an entire day here without breaking the bank. Our fave is the cream bath treatment, complete with the best shoulder massage we’ve ever had, and the most delicious complimentary ginger tea! La Beaute, Jl Pengubengan Kauh No. 18, Kerobokan, p. +62 361 847 6074. Open Tuesday – Sunday 10am – 8pm. Meaning “dancing fingers”, Jari Menari delivers results-oriented, always-consistent massages that keep us going back for more, time and time again. The all-male therapist team undergoes year-round training in anatomy and physiology and are well-qualified to personalise the experience to your body’s needs and condition. Their specialty? Blending strong massage strokes with rocking movements, stretches, and palm pressure. Jari Menari, Jl Raya Basangkasa No.47, Seminyak, p.+ 62 361 736740. Open daily 9am – 10pm. At the higher end of the price-scale (yet still incredibly affordable) Sundari Spa is a luxurious Seminyak spa without the hefty price tag. The focus here is on holistic approaches, with advanced skin care procedures, cutting-edge modern technology and that serene spa-aahhh atmosphere. Try the signature Balinese massage for an affordable bliss sesh, or splash out on the multi-treatment healing rituals. Sundari Spa, Jl Petitenget No.7, Seminyak, p. +62 361 73 50 73 . Open daily 9am – 10pm. 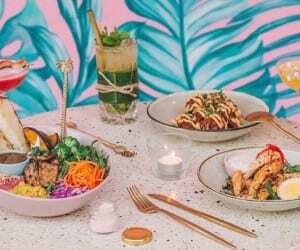 Just a few minutes from KU DE TA and the uber hip Potato Head Beach Club lies Bodyworks – one of Bali’s most iconic beauty institutions that, despite its flashy Seminyak address and gorgeous facilities, still offers great prices across its vast menu. It also comes with a solid rep from a loyal following after almost two decades of beautifying the neighbourhood. Head here to for a no-frills authentic Balinese massage or a flip-flop-prepping pedicure. Foot bliss, and so much more. This sanctum of all things chill will give you a top dollar experience for ridiculously reasonable prices. Leave the world behind you as you plug into your own music system and zone out while the therapists tackle those aching knots and foot pressure points. Male therapists are the norm here, so ask for a female therapist when booking if you prefer. Chill Reflexology, Jl Kunti 118X, Seminyak, p. +62 361 734 701. Open daily 10am – 10pm. Got a hot date or in need of some ‘me time’? 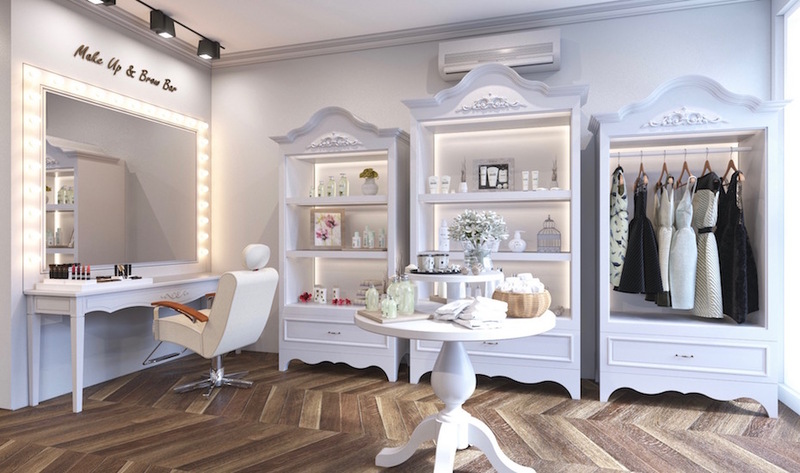 Get prepped and polished to perfection at this triple threat – a beauty salon, nail parlour and massage spot under one roof. The luscious blow-outs, signature massages and OPI manicures are all under $25, and men, you’re not forgotten because The Shampoo Lounge is also home to The Barber – the spot for a schmick shave, fresh fades or a couple of manly spa treatments. Heading to Nusa Dua? They have a second location there too. The Shampoo Lounge, Jl Raya Basangkasa 8X, Seminyak, p. +62 361 300 3451. Open daily 9am – 7pm. So popular that you simply must book ahead to secure your spa sesh, Devira Massage delivers some of the best rubdowns around. 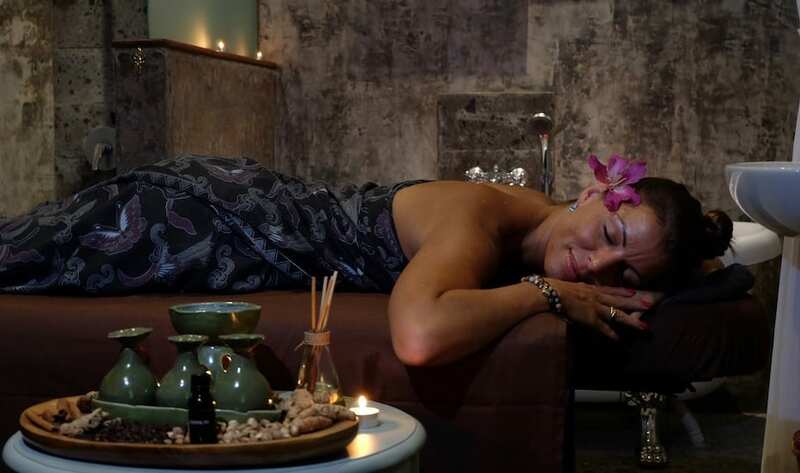 Specialising in traditional and deep tissue massage treatments to heal and rejuvenate, the therapists here have the hands of [powerful] angels, and all of the rooms are open-air, decked out with authentic Balinese decor. Devira Massage, Jl Batu Belig No.21A, Seminyak, p. +62 85 100 446 747. Open daily 9am – 10pm. When it comes to any jetsetters’ list of fave Seminyak spas, AWAY Spa at W Bali always comes out on top. A spa par excellence, this contemporary sanctuary of all things glam is for those who need to recharge before leading the charge into Bali’s party scene. 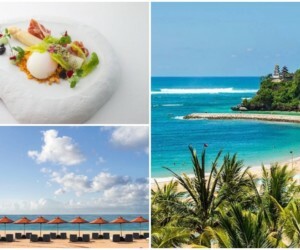 It’s a super funky wellness destination with a trendy treatments to match, from midnight massages and beachfront cabanas, to sips in the spa bar and rejuvenating sups in the Oxygen Room. And the best bit? AWAY Spa is open 24/7, because there’s no hour too late to pamper yourself silly. And yes, that means post-party oxygen facials avec a glass of Billecart, and 4am bliss-outs before an early morning flight to another fabulous destination. AWAY Spa at W Bali – Seminyak, Jl Petitenget, Seminyak, p. +62 361 4738 106, e. awayspa.wbali@whotels.com. Open 24 hours a day, 7 days a week. Nope, this isn’t a luxury hotel spa with sky-high prices. 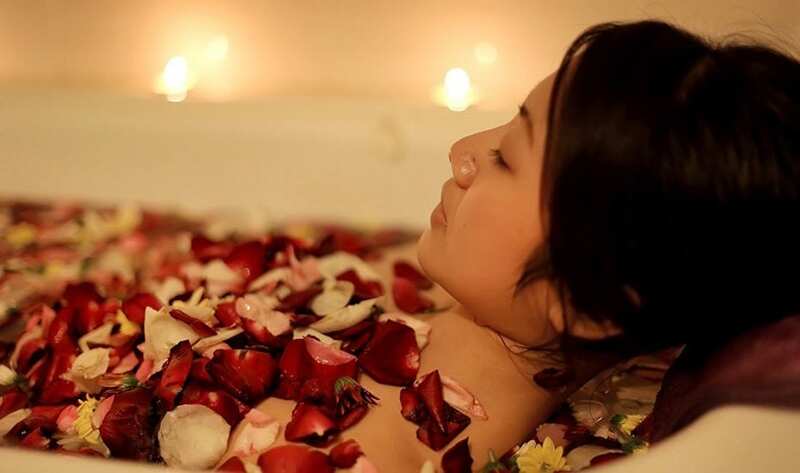 This is Vishaka Spa & Salon, where multi-hour spa packages are under $25, and the facilities, therapists and services are as top-notch as they come. 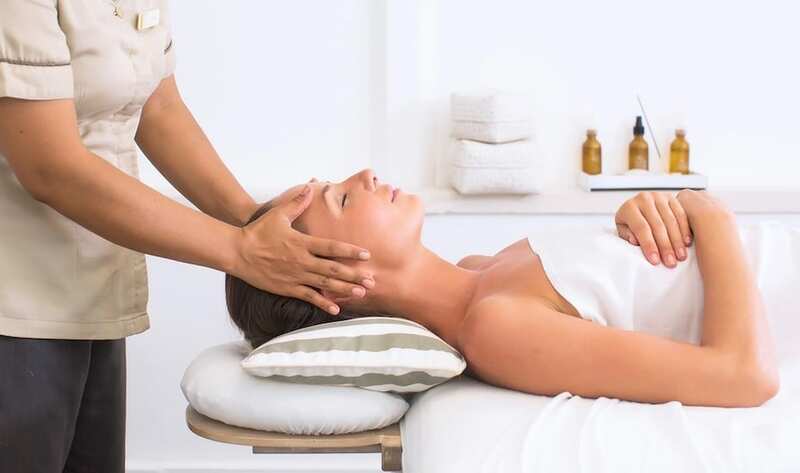 While the facials, hair treatments and mani-pedis here are our go-to, the massages are a real standout. Go for the Bamboo Massage if you like your rubdowns extra firm. Vishaka Spa & Salon, Jl Pantai Batu Bolong No.55, Canggu, p. +62 361 8445334. Open daily 11am – 10pm. What might look like a small nail salon from the front, Chillax opens up to an enormous spa sanctuary out back with more treatment rooms than we can count, all occupied by Canggu’s in-the-know spa-goers. 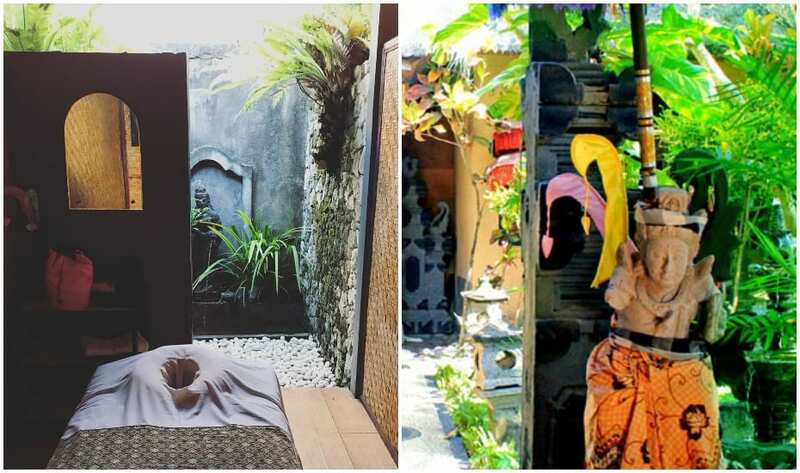 You see, this unassuming spa is a big name amongst Bali’s expat crowds, popular for its affordable treatments that hit the nail on the head every single time. With town locations in Canggu (one in Berawa, one in central Canggu) you’ll want to come here for their strong and effective massages, and finish with a mani-pedi on those sunflower-yellow squishy lounges. 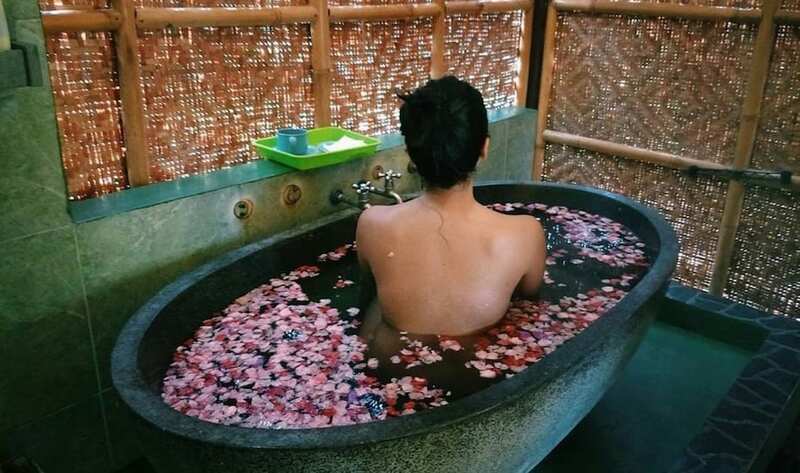 Chillax Spa, Jl Munduk Catu No 4, Canggu, p. +62 878 6256 6304 & Jl Semat Gg Bekul, Berawa, p. +62 819-9943-9615.
Who says a little “ah and ah” has to come with a ridic price tag? Let Massaji Bali Spa massage your aches and pains away for well under $15, with some of the most experienced staff around thanks to years and years of pampering the Canggu ‘hood. They specialise in hot stone and Balinese massages, but you’ll also want to try their facial treatments, with four different options to choose from. Massaji Bali, Jl Raya Canggu, Gg. Bedugul 3 – Br. Anyar Kaja, Canggu, p. +62 361 900 2588. Open Mon-Sun 9 am-9 pm. Sleek white interiors and supercharged treatments aren’t the only things found at this trending Canggu spa – one of our all-time fave spas on the island. So much more than just a place to primp and preen, Spring Spa is a social sanctuary complete with spa loungers, cold coconuts, icy mocktails and even an onsite DJ. On the menu, there’s a lengthy range of massages, manicures, waxes and facials to choose from, as well as blow-wave bar and hair salon. Our faves? Go for a spa package to really up the glam-o-metre, and don’t leave without a nourishing hair treatment either. Spring Canggu, Jl Raya Batu Bolong 83c, Canggu, p. +62 853 3844 7500. Open daily 9am – 9pm. Ubud Sari Health Resort, 35 Jl. 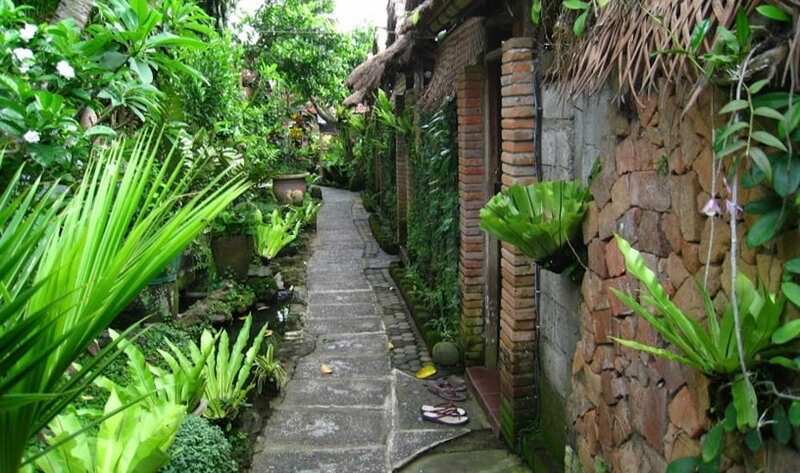 Kajeng Ubud, Bali 80571, p. +62 361 974 393. Open Mon – Sat 9am – 6pm. 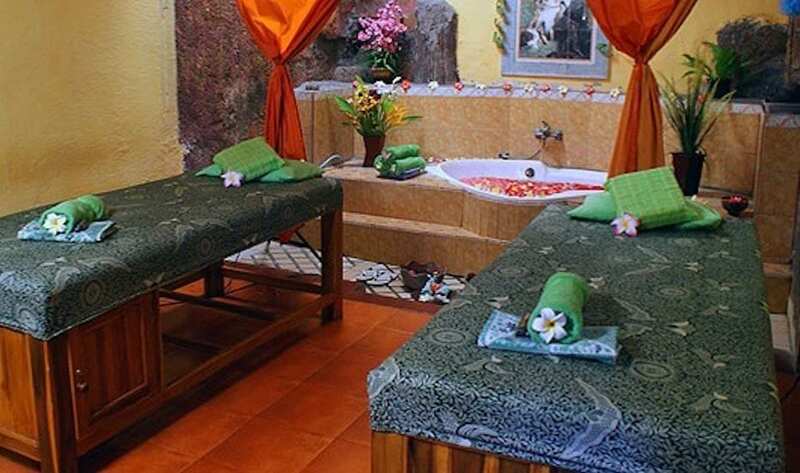 Verona Spa, Jl Monkey Forest, Ubud, p. +62 361 970975. Open daily 9am-9pm. Step into a mini Javanese jungle at Nur Salon & Spa, where you’ll find traditionally-built signature treatment rooms nestled amidst lush medicinal gardens. Rid your body of dead skin cells with a seaweed or tamarind Balinese massage (using entirely handcrafted products and ingredients from the garden) or try a half-day package to pamper from head-to-toe in a matter of hours. Nur Salon, Jl Hanoman No.28, Padangtegal, Ubud, p. +62 361 975352, Open daily 9 am-9pm. Body, mind and soul are the three key focus areas that 3point Spa promises to take care of. Chronic tension in the bod? Go for a deep tissue massage. Need a skin pick-me-up? Try the Pure Nature Facial and feed your skin with only the purest of products. Or, if you’re keen on picking up the art of massage, the spa also offers massage lessons, alongside some salon and beauty rituals too. 3point Spa, Jl Monkey Forest, Ubud, p. + 62 813 3725 2531. Open daily 9am – 10pm. Spa sessions don’t get more blissful than this. Spa Alila at Alila Ubud is an ultra-luxe health, wellness and beauty destination that’s all about holistic wellbeing. 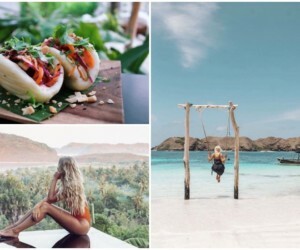 The indulgences here make use of the curative benefits of fresh, all-natural ingredients, while the beauty rituals blend ancient Asian healing techniques with age-old beauty recipes, including locally-inspired treatments like the traditional Balinese lulur body scrub. If massages are your thang, you won’t want to miss Spa Alila’s signature Therapeutic Massage for complete body awakening. Spa Alila at Alila Ubud, Desa Melinggih Kelod, Payangan, Gianyar, p.+62 361 975 963. Open daily 9am – 9pm. A true oasis in Jimbaran, Aura Spa offers a wide and exotic range of treatments from far and wide, like the Indian Aviangga massage, the Moroccan Hammam, and of course, the local Balinese cream bath. Feel like blissed-out putty in the therapists’ hands with a budget-friendly single treatment, or up the bliss factor with a package or three-hour spa & yoga program. Aura Spa, Jl Raya Kampus Udayana No.9 Jimbaran, p. +62 8133 8201 025. Open daily 9am – 9pm. Beach bliss right here! Created from eco-bamboo and indigenous black & white stone, Karma Spa at Karma Royal Jimbaran is an affordable spa destination dedicated to offering affordable therapies beach-side. Soothe any aches and pains away, and ease into a state of utter Nirvana with their organic rituals, limited edition product lines and seasonal treatments. While the prices here are on the higher end of the affordability scale, they’re still surprisingly budget-friendly for such a prestigious destination. Karma Spa at Karma Royal Jimbaran, Jl Uluwatu, 18x, Jimbaran, p. +62 361 701 1737. Open daily. 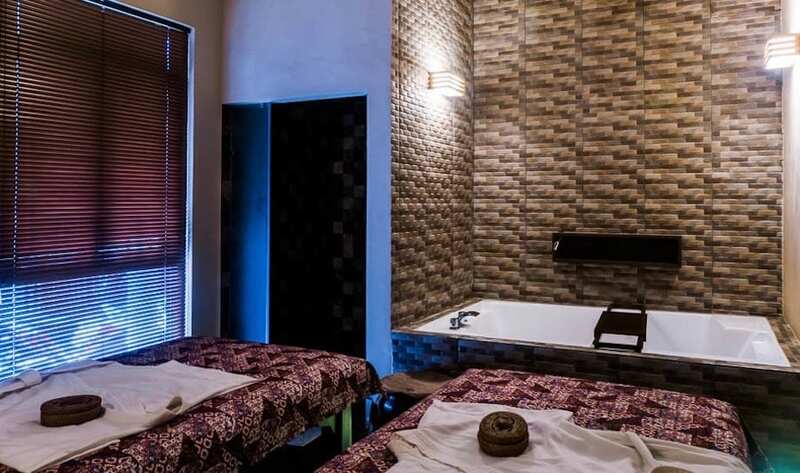 Forget fancy facials or languorous cream baths – if your body is crying out for a good massage, just head to La Vie Spa. Toting itself as a “total sensation” massage, this is where you want to be for homey spa comfort, where warm thumbs and firm palms do their thang. Slip into their comfy PJs and enjoy a wide array of treatments, like the fabulous foot rituals that take place on inclined massage beds – heaven! La Vie Spa, Jl Kampus No.18L, Jimbaran, p. +62 361 8953 489. Open daily 9am – 12am. There’s nothing quite as serene or soothing as a Japanese Shiatsu massage, and at Kunthi Bali Spa they’ve got it just right. This clean and elegant spa is a local fave, with heavenly indulgences you’d only expect from a more luxurious spa (the gorgeous flower baths is a must!). Shed any stiffness and fatigue with an aromatherapy massage, or take your pick from the range of four to five hour packages that won’t break the bank. Kunthi Bali Spa, Jl Parigata No,1 Jimbaran, p. + 62 851 0063 8867. Open daily 9am – 11pm. If lush greenery and a fuss-free massage sounds like your cup of tea, then the view of the mango garden alone at Tamara Spa will be calming enough, as your tension evaporates with a warm stone massage or traditional facial. To really refresh and revitalise, try their spa packages that range from 2 to 4 hours of bliss. Tamara Spa Bali, Jl By Pass Ngurah Rai, No 999A, Jimbaran, p. +62 361 917 4533. Open daily 9am – 10pm. The Spa at Four Seasons Jimbaran Bay, Jimbaran, p. +62 361 701010. Open daily 9am – 9pm. One of the best value spas on the island, Febri’s Spa is an oasis of relaxation to suit a myriad of budgets. The more upscale treatments take place in outdoor spa cottages for complete privacy, while manis, pedis and more have their own dedicated lounge. Mummies can feel yummy again with low-price Balinese massages, facials and a variety of body treatments (like scrubs and masks) as well as a dip in the jacuzzi – and you’ll leave with plenty of change in your pocket too. Febri’s Spa, Jl Kartika Plaza, South Kuta Beach, p. +62 361 754575. Open daily 8am – 8pm. Low-key luxury beckons at this traditional spa, located within the stunning grounds of AlamKulKul Resort that resembles a Balinese village. Using the finest ingredients like the age-old Jamu recipe, expect affordable spa treatments, healing massages, facials and even take-home products that have been made in-house using (you guessed it) that Jamu super-ingredient. Jamu Traditional Spa, Jl Pantai Kuta, Legian, p. +62 361 752520. Open daily 9am – 7pm. Tunjung Spa is the adjoining spa destination at Kuta Central Park Hotel, designed to combine both modern and traditional treatments with homemade, natural ingredients. Rid your body of toxins in the spa’s sauna, before letting go with a massage or revitalising Signature Facial. Or up the bliss with one of their affordable packages. Tunjung Spa, Jl Patih Jelantik, Kuta, p. +62 0361 769 222. Open daily 9am – 11pm. 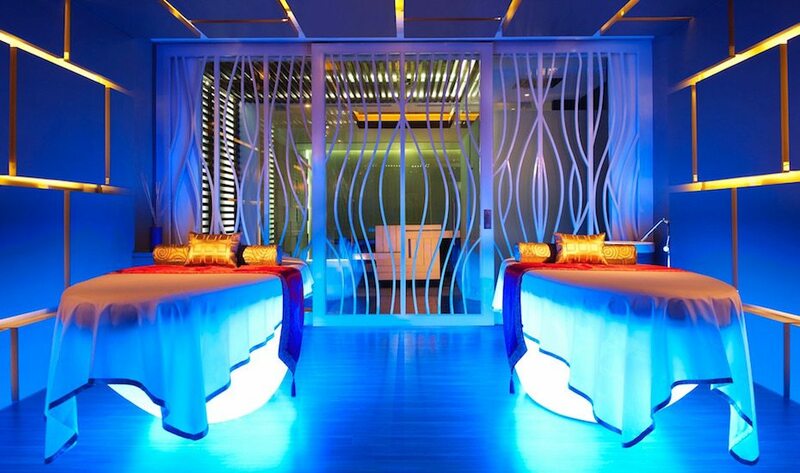 Amp up that glow from sunning on Bali’s glorious beaches with Bali Green Spa’s high mineral and toxic-free treatments. Earth-conscious folks will love this spa – it only uses organic ingredients sourced daily from local farmers to create all-natural massage oils. The range of spa offerings include aromatherapy massages and lulur body scrubs, and Psst.. if you purchase your treatments online beforehand, you’ll receive huge discounts. Bali Green Spa, Jl Sunset Road, Pertokoan Sunset Permai Blok D, Kuta, p. +62 361 841 3681. Open daily 10am – 10pm. When a spa is so popular it has to expand to not two but three storeys, you know it’s gunna be a goodie. 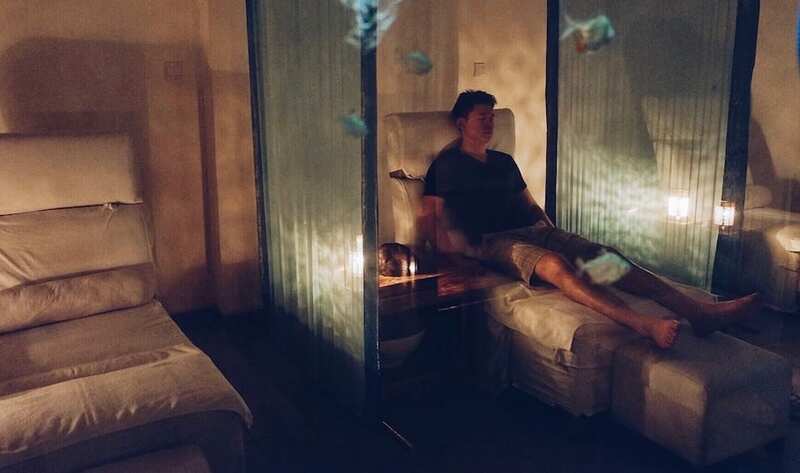 Well that’s exactly the case with Cozy Foot Reflexology Spa – a 3–storey spa shophouse with a menu that offers something for everyone – from sensational cream baths to express neck & shoulder therapies, and of course, some of the best foot rubs around. Bonus points for the low lighting and hypnotic fish tanks all around. Cozy Foot Reflexology Spa, Jl Sunset Road No 66, Blok A/3, Kuta, p. +62 361 766 762. Open daily 11am – 10pm. One name that’s always been right up there on the island’s must-bliss list is Acqua Perla Spa – the elite beauty and wellness destination at Double-Six Luxury Hotel. This contemporary sanctuary is set right on the coastline of swanky Seminyak, yet it’s a tranquil world away from the buzz of the bustling beachfront. Inspired by the flow, calmness and purity of water, Acqua Perla Spa is decked out in some of the freshest and most contemporary interiors we’ve ever seen. This innovative aesthetic is then coupled with a modern and ever-evolving menu of progressive, pampering treatments – all wrapped up in the fabulousness of Double-Six Luxury Hotel. Bliss! Leave your stress and worries at the door of Yoga Searcher’s Organic Spa, because this yoga and wellness destination is here to relax and rejuvenate both mind and body with specially curated traditional treatments designed to restore health, well-being, and to unwind tense energy. As the name suggests, the products used are all organic, natural and made locally following traditional healing methods. Swing by on a Tuesday or Friday evening (6pm-9pm) for “Detox Chilling Night” – discounted access to the sauna, steam and outdoor ice-plunge beneath the stars. 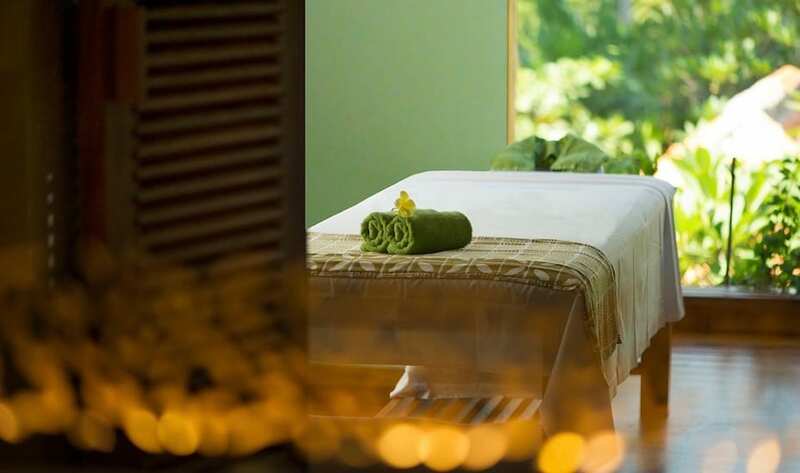 Organic Spa at Yoga Searcher, Jl Labuan Sait Suluban, Pecatu – Uluwatu, p. +62 81 1399 0150. Open daily. A spa that’s all about U (and your nails, hair and skincare), U Spa in Uluwatu is a clean and contemporary budget spa that had us at boho-chic interiors. The bright white walls are interrupted only by lush green palms, oversized shells and bamboo and rattan trinkets, making for the perfect Bali-spa vibe. As for the treatments, they’re as profesh as you’d expect, sans the expensive price-tag. Think $10 massages and manicures that use natural, homemade products. U Spa Bali, Jl Raya Uluwatu No.70X, Uluwatu p. +62 8123 792 0112, e. uspabali@gmail.com. Open daily 10am – 9pm. Take a break from a sun-baked day at the beach and make a pit stop at Sanda Day Spa. Massages, body scrubs, manis and pedis are all super affordable with experienced therapists, and all come with cute add-ons like flower baths. For a honeymoon-go-to, indulge a little in the four hour long Rama and Shinta Treatment, inspired by the epic Ramayana Hindu love story. Sanda Day Spa, Jl By Pass Ngurah Rai No. 333x, Nusa Dua, p. +62 361 770 318. Open daily 10am – 10pm. Take a deep breath. Exhale. Breathe easy. These are the things you’ll be repeating at this open-air spa, dedicated to relieving stress in an al-fresco environment. 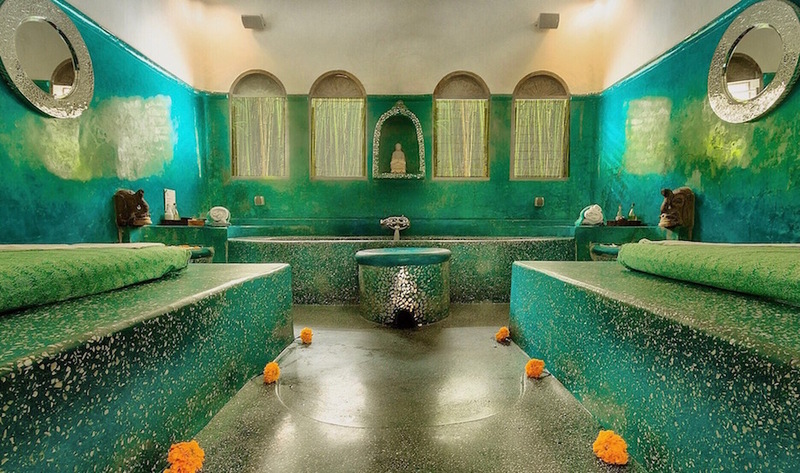 Feel pampered from head to toe with popular rituals like traditional cream baths, massages, facials and the mandi lulur, or get involved with a hands-on massage course. Top tip – book online for even more savings. Sekar Jagat Bali Spa, Jl Nusa Dua, Kuta Selatan, Nusa Dua, p. +62 361 770210. Open daily 9 am-10pm. If indulging in a luxurious massage beneath the shade of a beachfront, open-air spa sounds like your kind of heaven, then you’ll want to book into the Spa Bale at Vela Spa – the five-star pampering spot at Sundays Beach Club. Overlooking the ocean with a cool sea breeze as company, enjoy ultra-luxe treatments like a Rose & Frangipani body scrub, rejuvenating sports massages or healing foot reflexology – all with the sound of lapping waves out yonder. Our fave? Try the Vela Deep Cleansing Natural Facial with sandalwood, frangipani, sweet almond oil, pearl and rose, to name just a few of the organic ingredients used. Vela Spa at Sundays Beach Club, Jl Pantai Selatan Gau, Banjar Wijaya Kusuma, Ungasan, p. + 62 361 848 2111. Open daily. 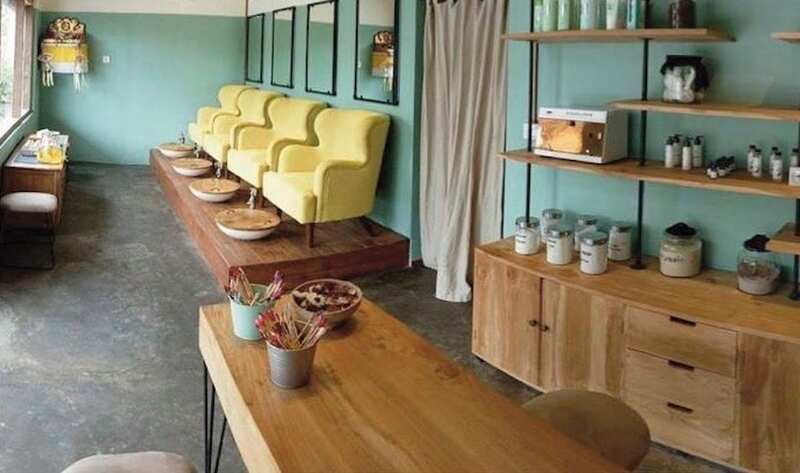 Glo Day Spa and Salon is arguably Sanur’s best spa that specialises in the lot: the best colourists, beauticians, massage extraordinaire’s and more – all for excellent value for money. This location houses every beauty whim desired, all under one roof. Think tanning, waxing, brows, lashes, massages, cuts, manis, pedis, weddings, parties, anything…! 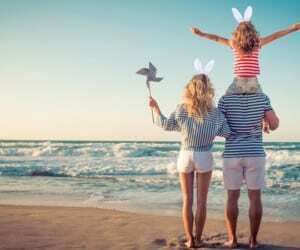 It’s all here, and the high quality service with affordable prices makes it an expat favourite. 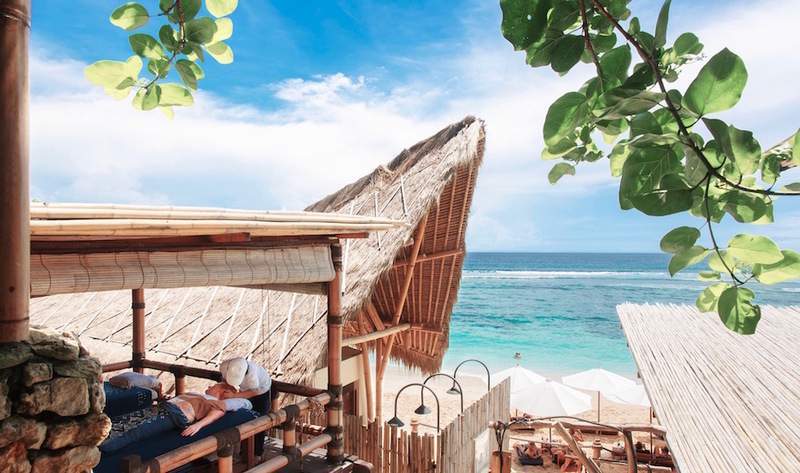 This Sanur location is one of four – they’re also in Canggu, Seminyak and Nusa Lembongan. Glo Day Spa and Salon, Gopa Town Centre, Jl Danau Poso No. 57, Sanur, p. +62 361 282 826. Open daily 10am – 8pm. The Nest Beachside Spa had us at “hello” with the promise of affordable head-to-toe pampering beside the seaside. 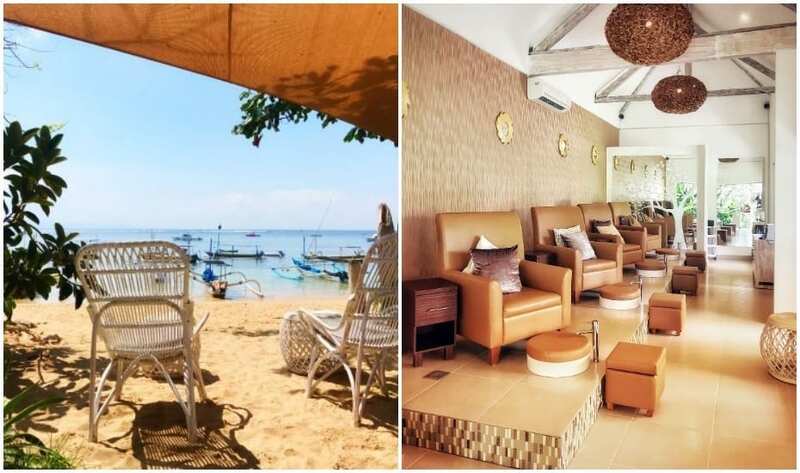 The choices are all yours here: go for an easy breezy massage on the sand at the beachside spa, or take the bliss indoors with a chilled out mani-pedi in the air-conditioned lounge at The Nest’s complementary boutique spa, just a few minutes inland in Sanur’s centre. The Nest Beachside Spa, Jl Duyung (on the beachfront), p. +62 361 938 1523. Open daily 9am – 8pm. 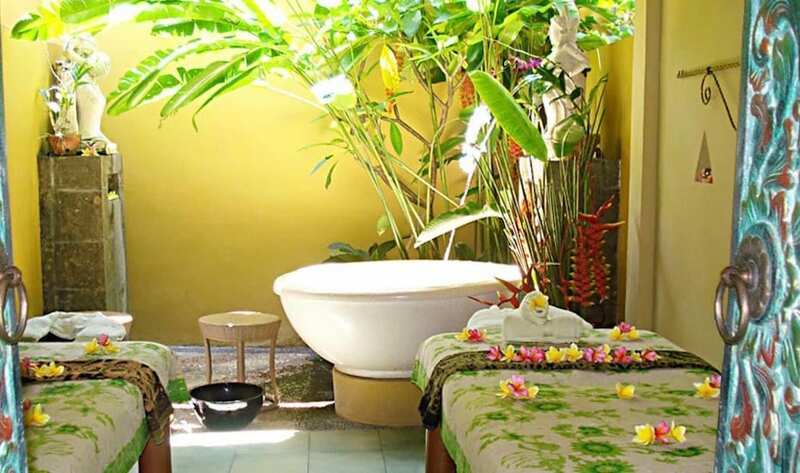 Located in the upscale area of Sanur lies this gem, Margot Spa. 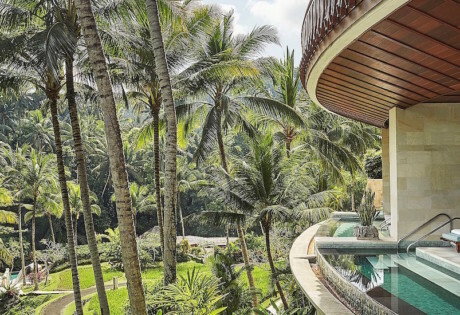 It’sa family-run spa that’s surrounded by acres of greenery, dotted with seven Balinese villa-style spa treatment rooms with wide garden views over the Ayung River. The 60 minute Balinese aromatherapy massage is the standout here, as are the affordable manicures that are the best-value around. Margot Spa, Jl Padanggalak Sanur, p. +62 361 286139. Open daily 10am – 9pm. At The Pavilions Bali, the quiet charm and laid-back rhythms of Sanur really come into play. Think airy treatment rooms and private gardens with the sounds of nature as a soundtrack, plus all-natural ingredients from nearby producers. While most treatments here are at the top-end of the affordability scale, keep your eyes on their spa promotions for mega deals and 50% discounts on multiple treatments. The Pavilions Bali Spa, Jl Danau Tamblingan No.76, Sanur, p.+62 361 288381. Open daily. Step into the tropical paradise of Maya Sanur’s Spa and discover a world of absolute decadence, surrounded by reflecting pools and exotic gardens. You’ll find a complete wellness experience here, with a comprehensive menu of holistic treatments that use Spa at Maya’s own natural products. 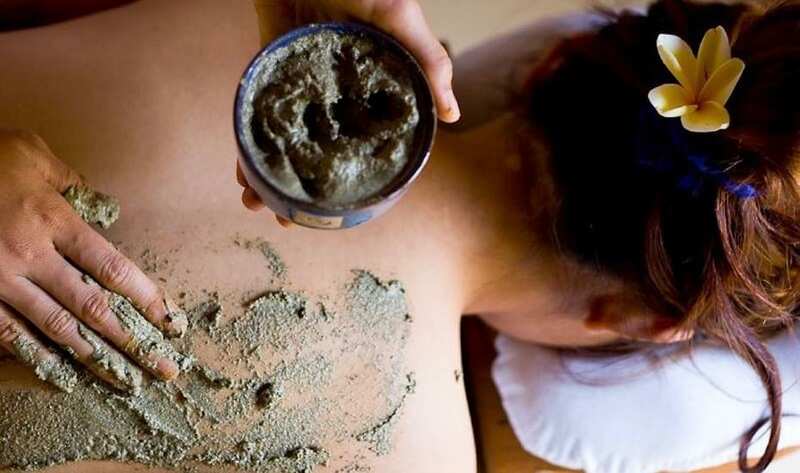 While the massages here really are something to shout about (the hot stone massage is a clear standout) we’d also highly recommend the body exfoliation and polishing treatments, using glow-inducing ingredients like chocolate, ginger, lime, salt and seaweed – the perfect recipe for lulling you into a state of spa bliss. 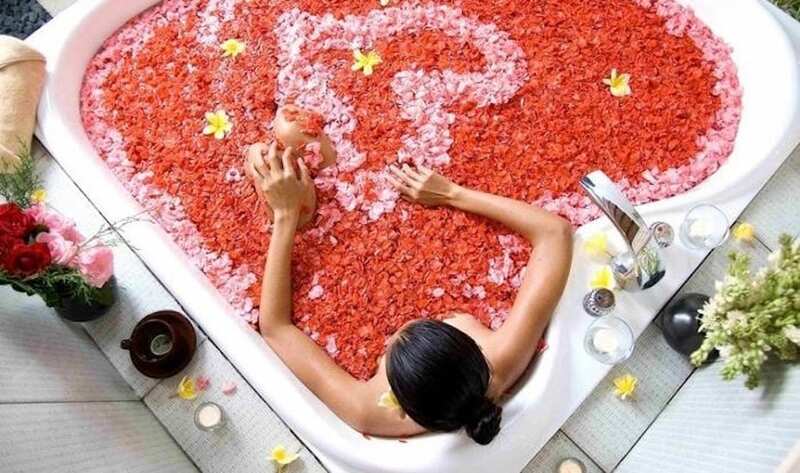 Spa at Maya Sanur, Jl Danau Tamblingan, Sanur, p. +62 361 849 7800. Open daily.